While a number of risk factors such as injury severity, demographic factors and compensation-related factors have been identified, none is strong enough to reliably predict which patient will develop the disorder. 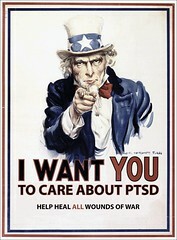 PTSD is characterized by flashbacks of the event, anxiety, and social withdrawal. Victims of major trauma are at significant risk of developing PTSD, with about 15% developing the disorder within a year of the injury. A study in the July issue of ANZ Journal of Surgery titled 'Predictors of Post-Traumatic Stress Disorder following Major Trauma' by Professor Ian Harris et al. argues that the lack of consistency of previous PTSD studies is a result of methodological flaws such as selection bias, and poorly defined diagnostic criteria. The authors investigated the association between injury severity, demographic and compensation-related factors with the development of PTSD and found that the disorder was also independently associated with having an unsettled compensation claim, their use of lawyer services and the placement of blame on others for the injury. A federal judge presiding over an important veterans' health care rights case against the VA has accepted into evidence a controversial email suggesting fewer PTSD diagnoses be given to veterans coming in for care. This is the same case that first had the government attempt to dismiss it in its entirety, arguing that vets have no legal right to expect specific types of medical care. The case moved forward nonetheless, with testimony and closing arguments taking place in April. Read more on this in the Fog City Journal, or more on April's trial (which I was too swamped to cover here at the time) in extended. A Putnam County veteran who was taking medication prescribed for post-traumatic stress disorder died in his sleep earlier this month, in circumstances similar to the deaths of three other area veterans earlier this year. Derek Johnson, 22, of Hurricane, served in the infantry in the Middle East in 2005, where he was wounded in combat and diagnosed with post-traumatic stress disorder while hospitalized. Military doctors prescribed Paxil, Klonopin and Seroquel for Johnson, the same combination taken by veterans Andrew White, 23, of Cross Lanes; Eric Layne, 29, of Kanawha City; and Nicholas Endicott of Logan County. All were in apparently good physical health when they died in their sleep. Johnson was taking Klonopin and Seroquel, as prescribed, at the time of his death, said his grandmother, Georgeann Underwood of Hurricane. Both drugs are frequently used in combination to treat post-traumatic stress disorder. Klonopin causes excessive drowsiness in some patients. He also was taking a painkiller for a back injury he sustained in a car accident about a week before his death, but was no longer taking Paxil. On May 21, Nashville Public Television, National Alliance on Mental Illness-Tennessee, and YMCA/Restore Ministries hosted a day long summit amidst the backdrop of magnificent Foundren Hall. The weather and the charm of the Scarritt Bennett Center grounds couldn't have been any more inviting. And those gathered couldn't have been any more gracious or interesting or sharp. "Healing the Hidden Wounds," a symposium on veterans and combat related depression united the area's stakeholders for a day of networking, brainstorming, and drafting plans for actions taken after the event. Efforts like these are welcomed and go a long way in supporting the mental health and successful reintegration of returning veterans and their families. The U.S. military says newly diagnosed cases of post-traumatic stress disorder [ptsd] among American troops sent to Iraq and Afghanistan climbed nearly 50 percent last year, bringing a five-year total to nearly 40,000. Army Surgeon General Lieutenant General Eric Schoomaker says the larger number of diagnoses in recent years partly reflects greater awareness and tracking of the disorder by the U.S. military. But he says increased exposure of troops to combat is a factor. Experts have said symptoms increase as soldiers return to combat for multiple tours of duty.